Beaverlodge Regional High School’s Hayden Hollowell had the top local placing at the ASAA High School Provincial Cross Country Championships in Cypress Hills on Saturday. The 17 year old runner placed 23rd in the Senior Mens 6 km race, recording a time of 23:37 over the difficult, hilly course. Other NW Zone runners placing in the top 50, included Kiana COWGER from the GP Comp (39th in the Junior Womens race) , Katrina ROTTMERHUSEN from Hillside, Valleyview (42nd, Junior Womens), and Lindsay Fehr from LaCrete (27th, Senior Womens). In the team standings, the GP Comp placed 31st among the 4A schools. St Joes and Beaverlodge were 29th and 31st respectively in the 3A standings. LaCrete was the top 2A school from the Northwest, placing 10th. Grande Prairie’s Ecole Nouvelle Frontiere was 10th among the 1A schools. 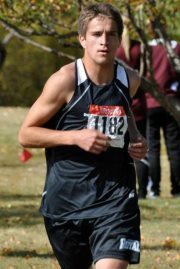 This entry was posted in Cross Country, Uncategorized and tagged ASAA, Beaverlodge, Cross Country Running, Grande Prairie Alberta, High school, Provincial Championships, Running. Bookmark the permalink.